Everybody who has a metal album from Bulgaria in the CD collection, please raise your hand! OK some of you is on the right track, but for me Eastern Europe is not one of my best mapped areas on the metal map. 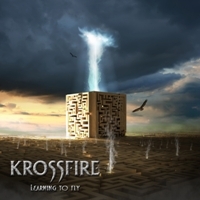 The talanted Bulgarians in Krossfire really woke me up with their debut album 'Learning to Fly' and showed me off. The band was founded in 2001, so the journey to this release date of the album has been certainly a curvy and hilly road for them. The bonecrucher track 'Warmachine' is a progressive and powerfull song that will stay for a long time in my iPod. The influence of Blind Guardian, Manowar and other epic bands are obvious and the orchestral melodies fits the vocalist Dimo Petkov like a hand in a glove. Not too much castrato or opera depth singing, but more of a muted tone in his voice mode. I like that! The title song 'Learning to Fly' is another "stay in my iPod track" where Georgi Kushev & co. on guitars deliver a massive and one of the top class tracks on LTF with some marvelous tempo changes and guitar riffs with solid metal hardness. A powerfull and strong vocal performance and atmospheric church choirs in the middle creates something memorable. 'Touch of Destiny' burns off in a high tempo mode, but floats into a stumbling and insecure song, but in the middle it turns into a instrumental golden earring. At the end of the album I found my personal favourite track on the album: 'Angels Cry' with with wonderful witty and spirited Maidne like guitars and with tight backing from the rythm section, this might be a future metal radio hit. The track 'Cold Winds' is a dark, melacholic and sad song with a nice guitar solo from Kushev. I was waiting for the mandatory ballad and in the end of the track list did they put 'The One' and on this tune, they got help from a female singer and the break from the hard and heavy sound is clear. A very calm and beautiful end of the record and this new experience has made my metal world map a little bigger that before. I've heard better metal bands, but I've been forced to listen too a hell a lot of of worser bands, that is obvious. Krossfire has an idea of what they like to play and brings it out to the world. That is worth some extra credit from me. Something for the curious who wants to broaden their horizon. Krossfire: Bass: Georgi Driev, Drums: Spas Markov, Guitars: Georgi Kushev, Vocals: Dimo Petkov, Keyboards: Peter Boshnakov.